We recently upgrade our webserver from II6.0 to IIS 7.5, everything works fine except the ReportingViewer control that renders the MSSQL Reporting in Asp.NET. It shows a blank page with missing icons in IE 6.0 and displays missing resource on FireFox. To solve the problem, you need to add a new Manager Handler in IIS Manager. I have installed BizTalk Server 2006 R2 on my Windows XP SP3 machine and trying to make the BizTalk WCF Publishing work. Publishing went fine but when I tried to access the service using the url location (recieve port location) I was plagued with errors. Failed to access IIS metabase. Exception Details: System.Web.Hosting.HostingEnvironmentException: Failed to access IIS metabase. 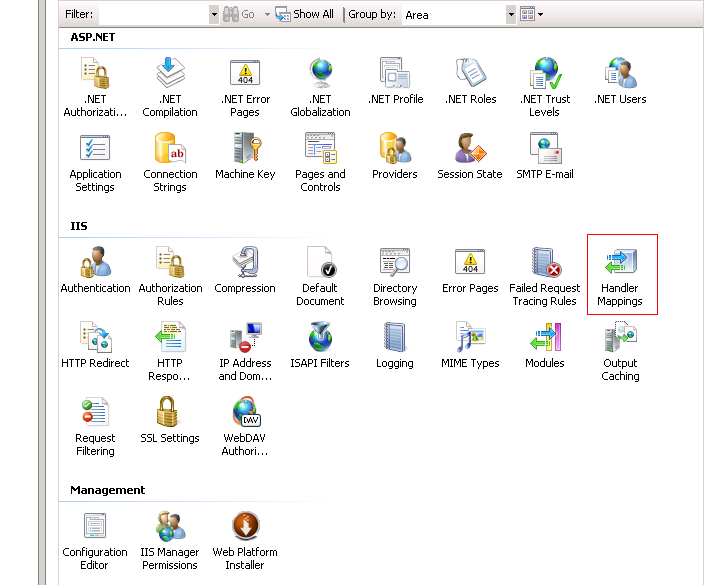 The process account used to run ASP.NET must have read access to the IIS metabase (e.g. IIS://servername/W3SVC). The Messaging Engine failed to register the adapter for “WCF-BasicHttp” for the receive location “/RPaulo/TestService.svc”. Please verify that the receive location exists, and that the isolated adapter runs under an account that has access to the BizTalk databases. An attempt to connect to “BizTalkMgmtDb” SQL Server database on server “RPauloBts” failed. Quickest fix is to add the ASPNET account to both BizTalk Application Users and BizTalk Isolated Host Users.